The feud between President Donald Trump and House Speaker Nancy Pelosi is on the verge of boiling over, with the Democrat accusing the president of creating a security risk for her and a congressional delegation that was planning a trip to Afghanistan, as a new Rasmussen poll shows neither would win a popularity contest. 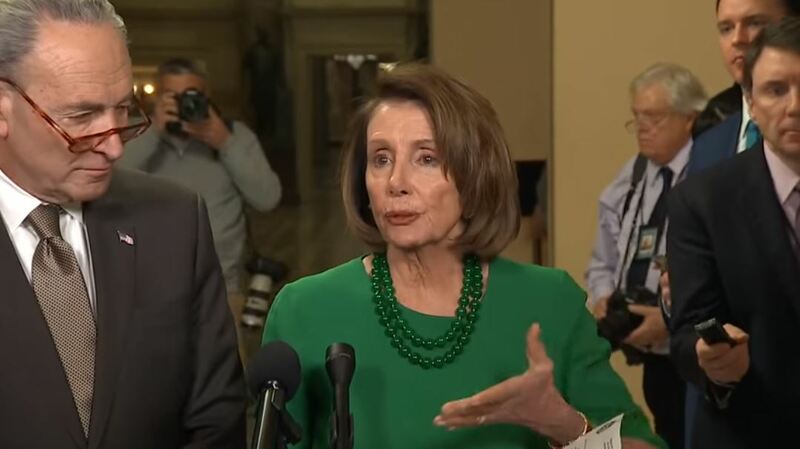 House Speaker Nancy Pelosi is more unpopular with likely voters than she is popular, and Sen. Charles Schumer (left) doesn’t fare so well, either, according to a new Rasmussen survey. After Trump cancelled military transportation for Pelosi’s junket to ostensibly visit U.S. troops in Afghanistan, Pelosi apparently planned to fly commercial, but those plans were cancelled, according to the Associated Press. Pelosi is claiming that Trump had “caused a security risk by talking about the trip,” the AP reported. But according to the Daily Mail, a “senior White House official” bristled over that claim via email. As the dispute between Pelosi and the president continues to heat, Rasmussen is reporting that half of likely voters have an unfavorable opinion of her. At the same time, 55 percent don’t care for the way Trump is doing his job, either. And Senate Majority Leader Mitch McConnell is in no better shape, with 49 percent having an unfavorable opinion of him in the latest Rasmussen survey. Americans may like a good scrap now and then, but they evidently dislike the kind of nastiness that now seems to pervade political discourse in the nation’s capital. Another Rasmussen survey reveals that 62 percent of likely voters believe the Founding Fathers would not approve of the size of today’s federal government, either. The partial government shut-down, now almost a month old, does not appear to have had much of an impact, perhaps other than as a spectator sport as the public watches to see which side folds first.